Imagine the rusted remnants of a playground, the merry go round with the paint peeling from all sides, the swings that stand motionless, the seesaw that moves up and down slowly, in a sad nodding of the memories of the shared enjoyment that it once had. The playground equipment is still functional, but only just. With each creak and squeak of the rides in the long deserted playground, we are reminded of the fickle nature of memory, the eeriness of the abandoned and the disquiet harmony of dissonance. 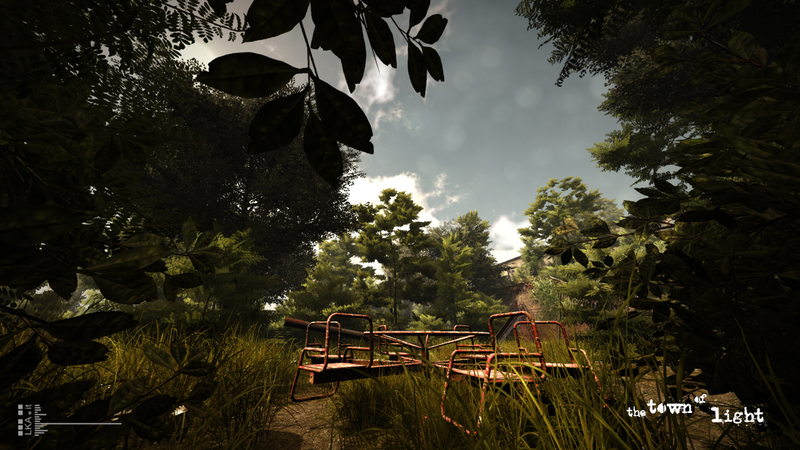 Inspired by actual events from the 1940’s, the slow, haunting notes of a faraway piano echo throughout your mind as you explore the empty, but not quite devoid of life Volterra Asylum. Traversing the grounds and dimly lit rooms of the two-story facility, attempting to piece together the fragile and shattered memories of our young protagonist. The concept of light itself is used in multiple ways throughout your adventure. The darkened rooms and dusky halls of Volterra Asylum let in little pleading shards of sunlight from outside, carefully peeking through rusty bar laden windows, offering brief glimpses of the shadowed horrors of the past endured by the tortured residents who once littered the grounds. As a narrative device, light is also used as both a source of pain and also as a sense of comfort, as different points in the story. It’s something of an interesting juxtaposition between the blinding, searing white light that singes the mind and the warm soothing light that breaks the icy tendrils of darkness, both referenced in your travels. Symbolically, light also represents illumination, as you’re struggling to piece together your memories, as painful as they are. With each new discovery about yourself and this world, the lingering shadows seem somehow a little less intense, and a bit less foreboding, in a way. Light is also a constant in the form of a trusty flashlight which serves as an invaluable beacon, and at times, even a friend. In the end, The Town of Light serves as less of an exploration of a forgotten asylum and more of an exploration of one’s own mind. It stands as a testament to the fact that some truly painful memories can never be fully locked away, some chains can never fully be broken, and some terrors, those that dwell in the obscure recesses of the mind, clawing just beneath the surface, shouldn’t always be brought into the light.